Due to popular demand Schutt Log Homes and Mill Works will once again attend the R&K Gun Show in Kansas City On Feb. 16 & 17. Jan. 28, 2013 - PRLog -- KANSAS CITY, Mo. -- Schutt Log Homes and Mill Works is pleased to announce they will once again be attending the R&K Gun Show in Kansas City. After the tremendous response at last months gun show, Schutt Log Homes and Mill Works is excited to return to Kansas City to continue to promote their new products. " We would like to thank everyone who came out last month to make the show such a huge success. We hope to introduce our products to many more people this month." States Patrick Schutt owner of Schutt Log Homes and Mill Works. Located in Kingsville, MO. Schutt Log Homes and Mill Works has been creating solid Oak log home kits since 2004. Patrick Schutt-owner, is involved in every aspect of the process of creating these unique Oak log home kits. From the design, to harvesting logs, milling the lumber and kiln drying the logs and lumber, Patrick is completely hands on from start to finish. Patrick said " I believe I need to be involved in every part of the kit production process to ensure the quality of our product and complete satisfaction of our customers." 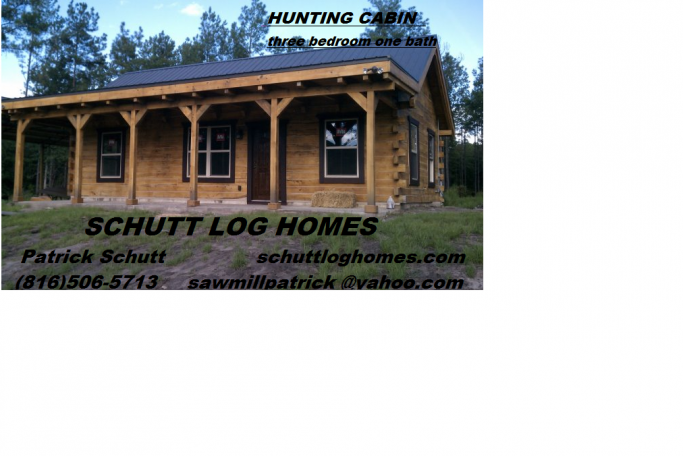 Schutt Log Homes and Mill Works produces solid Oak log home kits in a variety of styles. From the 400 sq ft one bedroom, one bath, Hunting cabin to the 3100 sq ft, three bedroom, three full bath, Mountain View Home. Each of these home kits come with ridge beams, rafters, floor trim, window trim, door trim, interior and exterior walls, porch railing, stair railing all made from solid Oak, Ship lap ceilings, hardwood flooring and swing ready covered porches. This company also produces custom milled specialty lumber. Schutt Mill Works prides itself on their selection of specialty lumber and ability to mill the lumber to almost any specification. Some of the specialty wood available includes Walnut, Coffee Bean, Cedar, Pecan, Maple, Ash, Elm, Black Cherry and more. 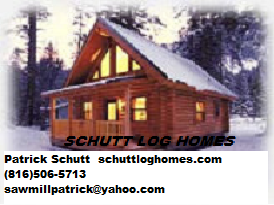 Any of the log home kits or wood products from Schutt Log Homes and Mill Works can be shipped any where in the U.S.
Stop in and visit with Patrick Schutt and check out some of the products Schutt Log Homes and Mill Works has to offer at the R&K Gun Show, Sat. Feb 16th 8am-5pm and Sun. Feb.17, 9am-3pm 2013. The Show will be held at the KCI Expo Center 11730 Ambassador Dr. Kansas City, MO. Schutt Log Homes and Mill Works Will Attend HorseFest March 22-24 in Springfield MO. 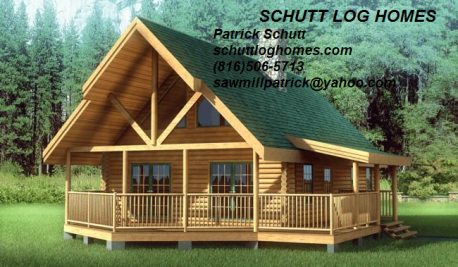 Schutt Log Homes and Mill Works Will be Exhibiting Their Latest Products at R&K Gun Show.